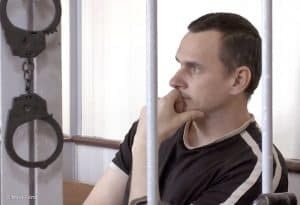 Ukrainian writer, filmmaker, and 2017 PEN/Barbey Freedom to Write Awardee Oleg Sentsov, an outspoken critic of Russia’s intervention in Ukraine and takeover of Crimea, is serving a 20-year sentence in a penal colony with notoriously harsh conditions after his arrest on terrorism charges that have been condemned by human rights groups as fabrications by a Russian government intent on silencing dissent. On February 26, the Day of Crimean Resistance to Russian Aggression, PEN America and a number of partners around the world will express their support for Sentsov with readings, rallies, and special events across the globe. Follow the hashtag #FreeSentsov to learn more about these events. A round-up of the day’s events will be published on our site after February 26.